Beresford TC-7510 review | What Hi-Fi? There's been a bit of a buzz on the forums on whathifi.com. 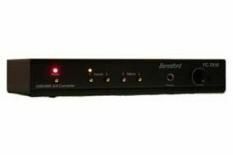 A number of our users have been talking about this small and very affordable DAC, which they say can make a digital system sound much better. Always inclined to pursue the interests of our readers, we duly sourced the Beresford TC-7510 to give it a thorough going-over. It's a simply designed box - as you'd imagine from the low price - but it's also solid and well built. The back panel has four digital inputs (two optical and two coaxial), so you can take digital signals from multiple devices. The front panel has selector buttons to choose which source you're listening to, a headphone socket and a volume control. As well as controlling the headphone output, this also adjusts volume on the 'variable' analogue outputs - so you can plug the DAC straight into a power amp. And for the money, the Beresford is an excellent upgrade: it offers a crisp, well-timed and tonally coherent presentation of whatever music you feed it. Good clarity and dynamics, matched to real punch and rhythmic drive, make the TC-7510 a genuine bargain.